Fixing rust that arises is an important part in the maintenance of your vehicles. 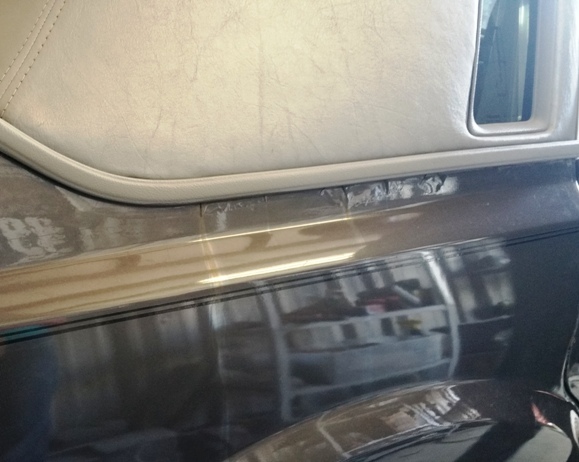 This week we did some rust repair on an 1989 Lincoln Continental. It only needed minor rust repair on the passenger side back quarter panel. As you can see from the Before picture, there were some cracks underneath the vinyl top. These cracks are from the paint shipping due to rust underneath. Once you start to see the little cracks and bubbles in the paint, it’s a good time to bring your car in to get the rust repaired. Rust spreads pretty easily, especially if the car is often exposed to water or moisture. 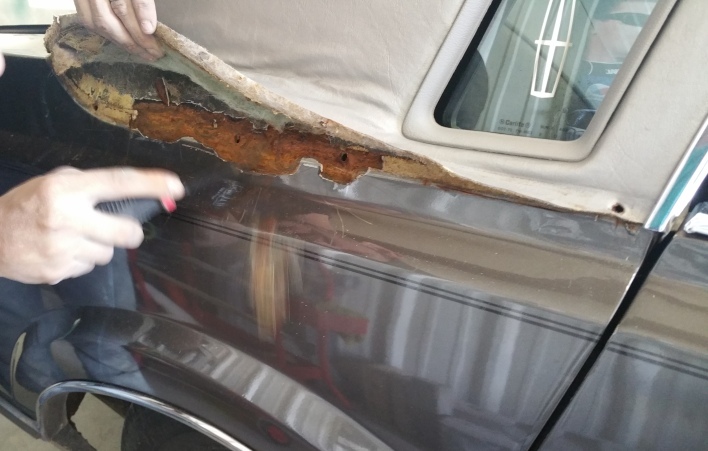 Fixing rust before it spreads will save you money in the long run. It’s always easier to get it before it gets out of hand. How we go about fixing rust is different depending on how bad it is. After pulling up the vinyl top, we saw that there was actually another vinyl sealed underneath with some welds from a previous repair. This may have been the cause of the rust, since any separation within a panel will eventually create moisture. In this case, we ground away the rust, sealed the panel with fiberglass and then did some minor body work to get the lines right. All the rust has been completely cut out and the panel repaired so that it won’t be coming back. 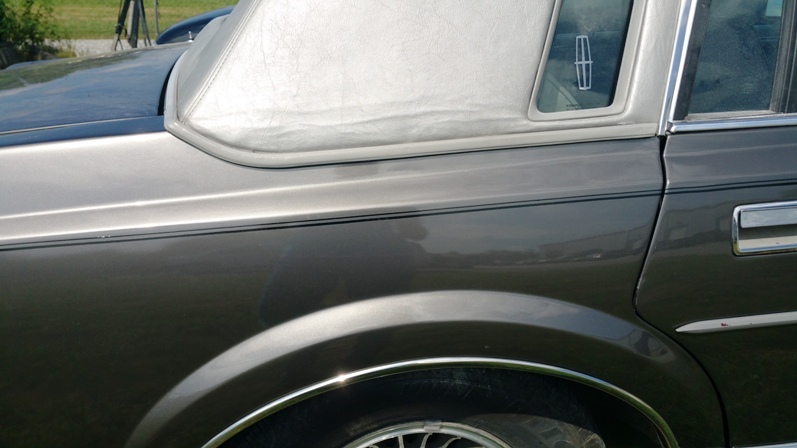 Of course, we then painted the panel to match the car, and reapplied the black pinstripes. It now looks brand new again! 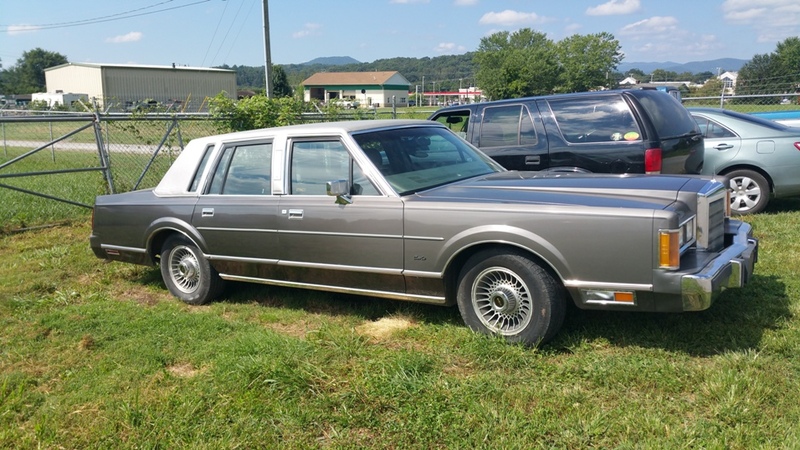 Here is the ’89 Lincoln Continental from afar… Good looking car! The rust is all gone and the panel has been painted to match the car perfectly. If you’ve got some rust issues we can take care of, call TD Customs at 828-505-6603 or stop by the body shop for a free estimate. No Replies to "Fixing rust before it spreads"